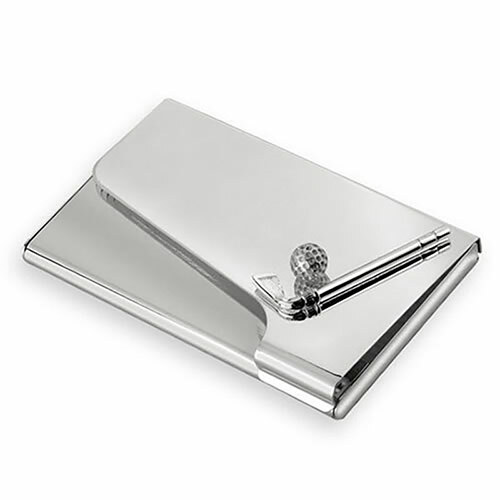 Ideal clubhouse gifts for your corporate golf day, these pocket business card cases have a golf theme on the lid and a silver plated finish that adds a touch of quality to your event or presentation. The sturdy metal case keeps business cards crisp and pristine, ready for when they are needed, and by engraving a logo or business name you can create useful and distinctive corporate gifts or merchandise. These business cards cases hold 10 - 12 standard size cards, or a smaller number of credit cards, and are offered here with bulk order discounts and free engraving.